Every list about cool bars in Berlin a while back would contain Bar Tausend. This place has so many interesting layers that it is hard to describe it. We still think it is cool. One must undoubtedly pay a visit to understand how special this place is. Let’s start with location. Bar Tausend is one of those specially “hiding in plain sight” places. Tucked under the train tracks on the other side of the river from Friedrichstrasse Station, it is almost impossible to spot the entrance if you are not fully paying attention. 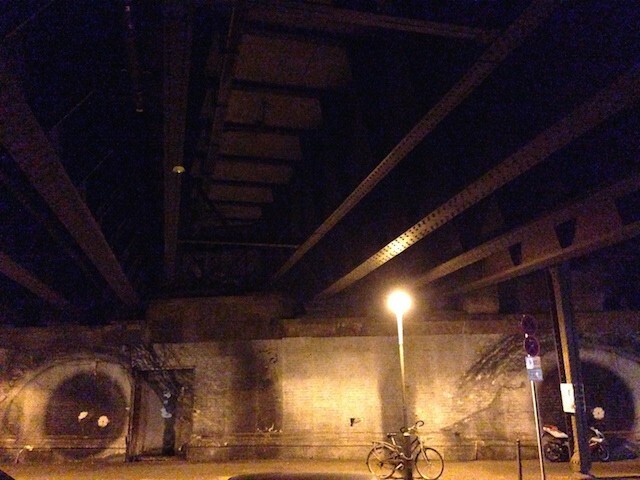 Walk along Schiffbauerdamm, once you’re under the train tracks and you see two giant eyes, you’ll know you are there. Closer to the left “eye” you’ll find a door. Ring the bell. The coolest looking host (a Daniel Day Lewis look-a-like) will invite you in. The decor is extremely slick and creative. There is a giant light fixture/mirror in the format of an eye to the right (you can’t miss it). The curved ceiling is completely mirrored leading to the stage area on the right hand side. The bar runs along the whole space and the lounge areas are super inviting. Earlier in the evening the Bar is relatively empty and the crowd is somewhat uninteresting. Later at night it can get quite full (except earlier in the week) and the crowd gets cooler as the hours go by. Bar Tausend has a consistently high quality line up of bands, djs and artists that come to play there. Check out their website for specifics. As you sip your cocktail (Kyoto is our favorite) you feel the continuous vibrations of trains going by just above where you’re standing. It’s fun! Unless you’re too drunk…and start thinking an earthquake is coming (relax, you’re in Berlin). The busier the place is, the more selective the door policy gets. They aim to attract a cool crowd, so you know what to do (don’t go wearing your baseball hat – or do…who knows what’s truly cool these days??). This place is smoke friendly (likemost cool bars in Berlin), so be advised. If you are looking for smoke free bar options, check out our favorites HERE. One way to get around the often strict door policy is to make a reservation for dinner at Cantina (the restaurant in the back – see Cantina Tausend for details). Once you’ve had dinner you can hang out at the bar for as long as you like. What we like to do at Bar Tausend: drink Kyoto + stay for the live band gigs.